In all simplicity and modesty, Estella Couture wraps her mind in her creations as one of Africa’s most sort after Designers not only in the USA but also around the world. Estella Couture met Lady Kate Njeuma, the Executive Producer of Miss Africa USA back in 2007 at the Miss Africa Preliminaries in Silver Spring Maryland. Estella was a judge at the preliminaries after which networking between the two followed. Estella was invited as one of the top designers for the Miss Africa USA Pageant in 2007. She designed for Miss Liberia and Miss Sierra Leone who were among the top 5 winners of the pageant with no doubt that their outfits certainly earned some well deserved points. The following year Estella was again invited, this time as the Designer for the pageant and her creative mind got to work, producing the Miss Africa USA Signature flag out fits. Each delegate had an outfit made to reflect the flags of their countries. 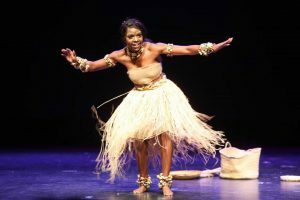 It was awesome, all the vibrant African colors were lighting up the stage at the 2008 pageant. It certainly was not an easy task to have accomplished either. Estella was fully on board with the Miss Africa USA Pageant with the most beautiful and glamorous designs for the Evenning Wear Segment. Great African fashion with Western theme. Estella Couture once againg performed beyond expectations. Lady Kate Njeuma is proud to congratulate Estella Couture for her dynamism and creativity, placing African Couture on the agenda in the global fashion industry. From the Miss Africa USA Pageant we say thank you Estella and May God Grant you more inspirations.